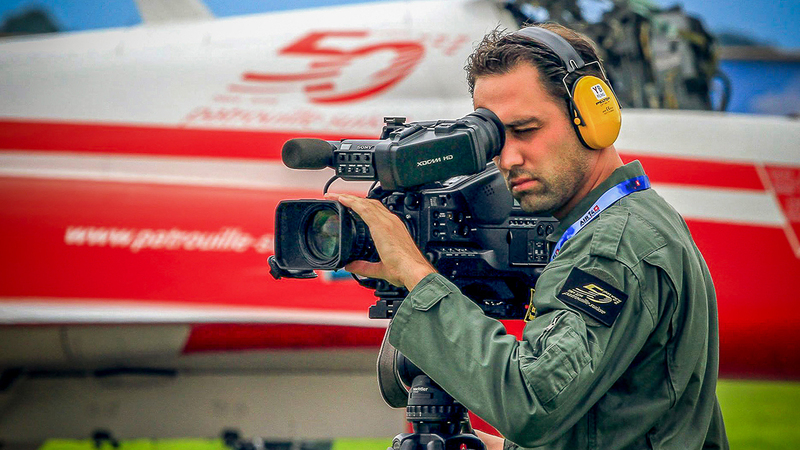 Hi, I’m Yannick Barthe, a Swiss aerial cameraman and aviation filmmaker. Since 2006, I’ve been traveling in Switzerland and abroad to film aircrafts, gliders, helicopters and other disciplines in the air with my company Yannick Barthe Films using the latest technology and video equipment to capture the beauty of flight – the third dimension like you have never seen it before. From the Rafale to the Airbus A380, through the legendary Mustang and Super Constellation, I’ve captured the breath-taking sequences and choreographies of the world’s most beautiful jets in formation like the Patrouille Suisse, the Patrouille de France or the Frecce Tricolori. The dream of flying has lost nothing of its attraction and its magic. Name and age: Yannick Barthe, 36. Language(s) spoken: French, English and German. 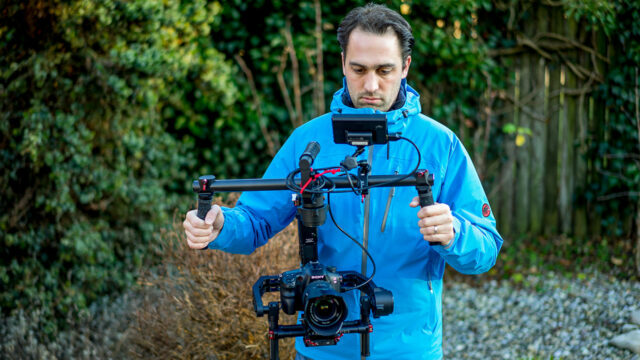 Occupation: I’m an independent aerial filmmaker and drone pilot working in my own company Yannick Barthe Films, and also a part-time projects engineer in the middle voltage network in north Switzerland. As I have family, I decided to have two jobs for reasons of financial security, so I have the privilege to choose the projects I would like to work on and I don’t have the pressure of accepting a video job only for the money. This means more freedom, more passion, more creativity, and it also leaves me the possibility to start personal projects without a commission. How did you get started in our industry? I’ve been passionate about cinema since an early age, even building a movie theatre in my house. I went on to study engineering sciences with a specialisation in multimedia and internet. Today, as an electronic engineer, I’m mainly interested by new technology and video gear. When my brother started to play around with remote-controlled aircrafts, I followed him to film his displays and started to install onboard cameras on his plane. Later, in 2004, my brother and I started working with drones under the project name AEROMEDIA. Together we developed a revolutionary system mounting a DSLR camera on a radio-controlled helicopter specially designed for aerial photography. That was before the days of quadcopters and it required very good piloting skills. In 2008 we added thermal imaging capabilities to our helicopter using a special infrared camera in collaboration with an architect of our district. 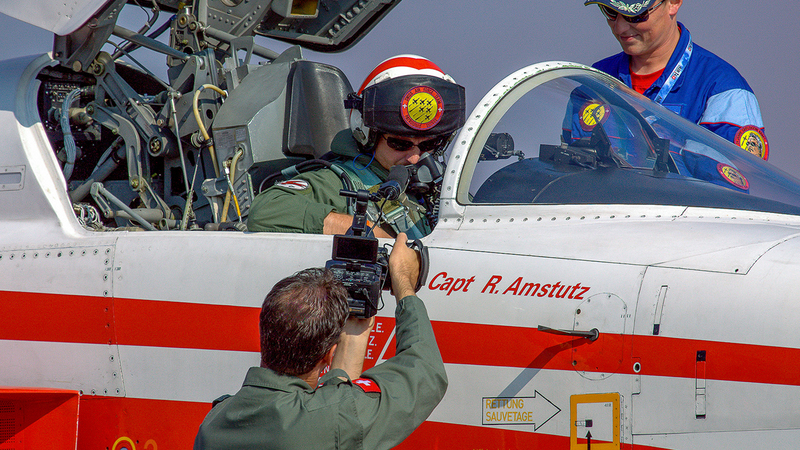 In 2006 I was commissioned to film my first aviation movie and it was the real start of my career in the aerial video production. 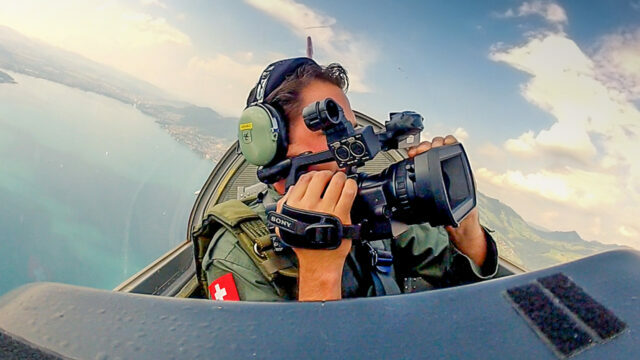 For 10 years I’ve been filming aircrafts and airshows in Switzerland and abroad, and I’ve been the main filmmaker of the aerobatic jet team “Patrouille Suisse” since 2012. Current assignments: My work is always related to aviation or aerial images, such as films or videos for aviation companies, airshows, competitions, private pilots, aerobatic teams, as well as aerial work for construction sites or tourism using drones. Beside my daily activities, current assignments in the pipeline include a new project with the Patrouille Suisse and four video projects of aerial pictures with drones. What is your dream assignment/job in our industry, and what are you really passionate about? Each project is unique and there is a challenge on every shot when you work with aircraft. What I’m looking for is good relations with people involved in the project. There are a lot of beautiful aircraft to film but it’s very important for me to have a good collaboration, friendship and a real trust between the people involved in the project. One can feel these emotions in the pictures. In the work that you are presenting us, now that it is done, what would you have done differently throughout the production? Sometimes it’s hard to explain to customers the difficulties and needs involved in filming some of their ideas. One can’t make low cost videos when it comes to quality air-to-air footage. These days, I make the needs and costs of the project very clear right at the beginning, I keep my position and don’t hesitate to say “no” if I get a bad feeling. What current camera, lenses and sound equipment do you use? After several years with Sony ENG cameras and the amazing and easy-to-use B4 lenses, I decided to jump to Super 35mm and 4K resolution to answer some of my customer’s needs. In 2014, I updated my whole workflow to 4K, and now work with a Sony FS7. 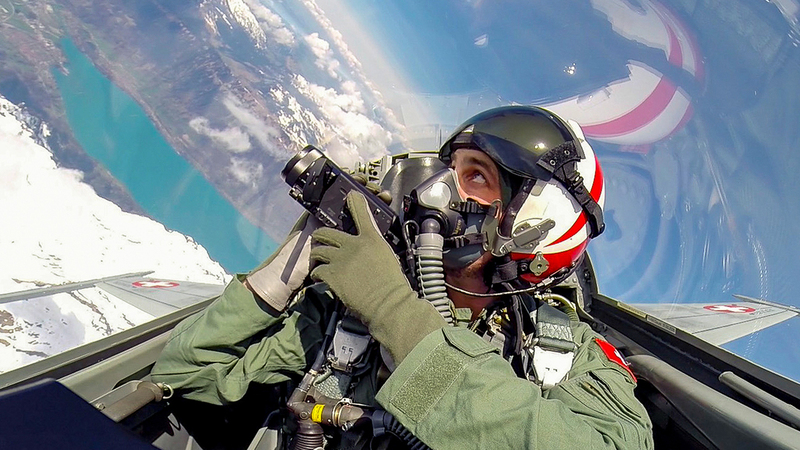 For my air-to-air shoots with aerobatics and high G-forces, I also work with my small Sony AX100 or a Sony Z100. My Sony FS7 is equipped with a set of Sony lenses: Sony PZ 18-110 F4, Sony Zeiss 16-35 F2.8, Sony Zeiss 24-70 F2.8 and Sony 70-400mm G II. 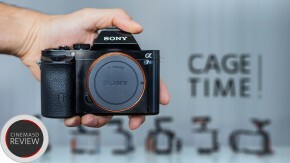 When I need to film in confined areas or small cockpits, I also use the Sony A99 or the Sony A7 family of full-frame cameras. Of course, I also carry a lot of GoPros everywhere with me. 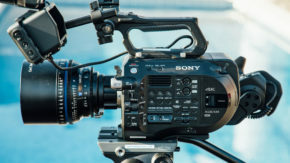 You chose to shoot your project with Sony FS7 video camera. Can you please describe why you chose to use it, what was your workflow, were you happy with the results and will you ever go that way again? I’ve always worked with Sony video cameras. Of course, other brands are also very good, but when you already have accessories it’s easiest to stay with the same brand. You can share your batteries, charger, lenses, monitor and media cards. The Sony FS7 is very good bang for your buck. 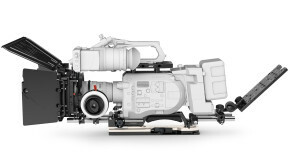 With one camera body I can film broadcast videos or cinematic films, 4K and slow-motion. 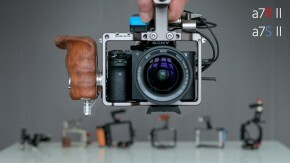 The ergonomics are also way better than the old FS100 and FS700. What’s your favorite light equipment and why did you choose that kit over other solutions? Most of the time I film in the air as a single cameraman, so I have to manage my scenes with natural light. Do you use drones or gimbals in your productions? If so, what is the most effective way you’ve found to deploy them? I own a DJI Ronin and 4 DJI drones, from the smallest to the biggest one. They are real game-changers and an important tool for my aerial work. I fly and film with drones several times a week, but I don’t use the Ronin very often. For most of my aviation projects, I need to work alone in the cockpit or on the tarmac. When you are on a military airfield between planes, you do not have the time to handle a lot of equipment. You also need to stick to strict security rules. This is why I usually prefer working with my FS7, a zoom lens and my tripod. What editing systems do you use? After several years of editing with Final Cut Pro 7 and an 8-core Mac Pro, I was forced to switch to Adobe Premiere to edit 4K images. I really did not like the first version of FCPX. The last version is a lot better and I started to work with FCP again a few months ago. How much of your work do you shoot in Log and what is your preferred way of colour correcting? 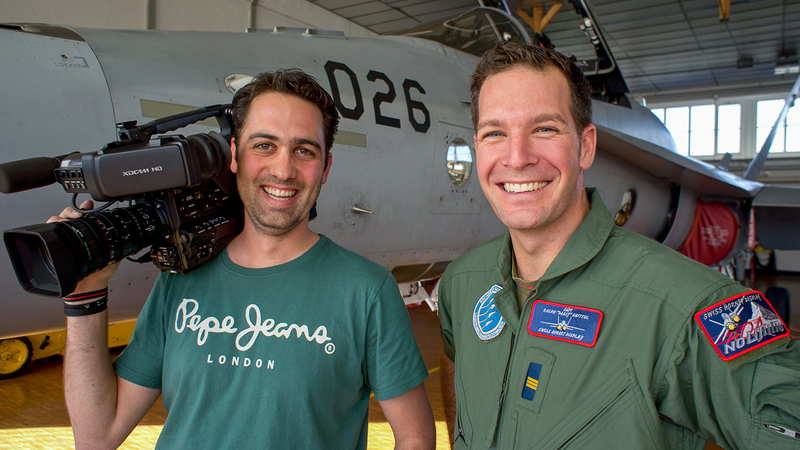 For most of my work, I don’t film in Log because I need to work very fast and share parts of the footage with TV channels or airshow organizations just a few hours after filming. I always try to colour correct my footage to look as natural as possible. Aviation and air-to-air already provides such beautiful and colourful imagery, that I don’t want to change the colours too much. I just correct white balance and adjust saturation and contrast. How frequently do you travel, and do you have any tips when it comes to packing your gear? Travelling with video gear is the biggest pain in this job. I’ve had a few bad adventures with broken gear when I’ve travelled with airplanes, so I choose to travel by car as much as I can if the shoot is not too far away. For daily jobs, I own the Think Tank Logistic Manager 30. Many times I need to carry my gear to the top of mountains and other confined areas only accessible by foot – for these situations I use the big Kata GRIZZLY-3 Pro-Light Backpack. If you enjoyed Yannick’s work, head over to his website www.yannickbarthe.ch. 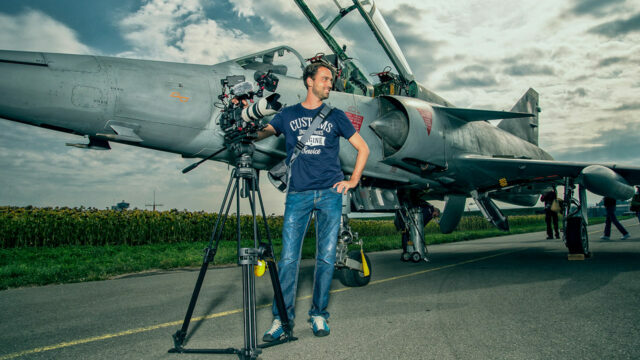 For 10 years, Yannick has been specialising in creating aviation and aerial films, using the latest technology and video equipment to capture the beauty of flight with emotion and breathtaking images. Yannick is exceptional! This is one of the most demanding types of photography/cinematography that a creative can undertake and he makes it look like a walk in the park.